A Baltimore grand jury has indicted all six police officers charged in the death of Freddie Gray, State’s Attorney Marilyn Mosby announced today during a press conference. 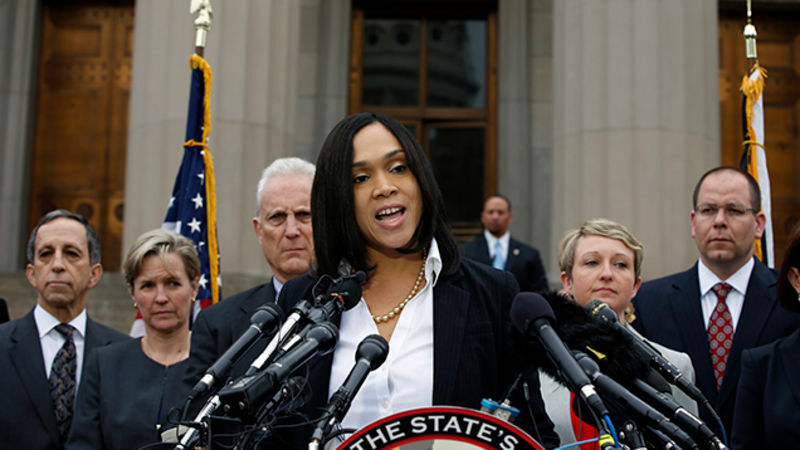 The revised charges are similar to those announced by Mosby earlier this month. On Friday, attorneys for the six officers charged in the death of Freddie Gray filed a motion Friday to dismiss the case, the Baltimore Sun reports. They also asked State’s Attorney Marilyn Mosby to recuse herself, citing “overzealous prosecution” and conflicts of interest. According to a police report obtained by the Guardian, Brian Rice, the most senior Baltimore police officer charged over the death of Freddie Gray, used his position as a lieutenant in the Baltimore Police Department to demand that police in a nearby city arrest his ex-girlfriend’s husband. Earlier reports indicate that Rice had previously threatened to kill his ex-girlfriend and her husband and to commit suicide. 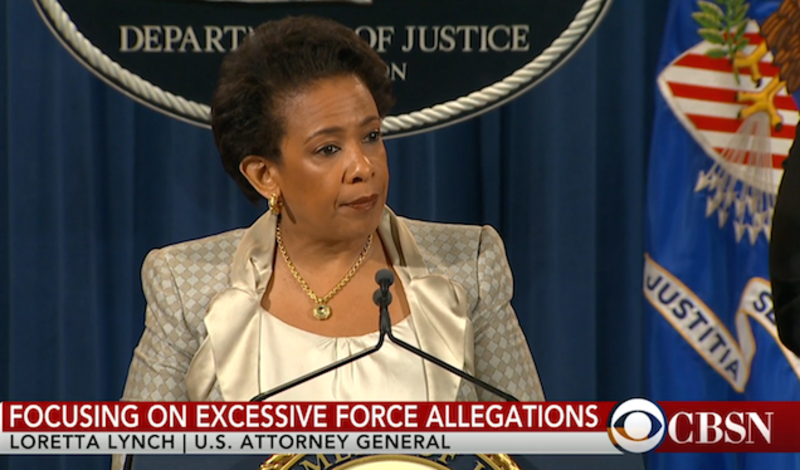 Attorney General Loretta Lynch just announced a federal civil rights investigation into the Baltimore police department in response to the death of Freddie Gray. A similar investigation by the DOJ into the Ferguson police department uncovered systematic racism and well-documented examples of police brutality. 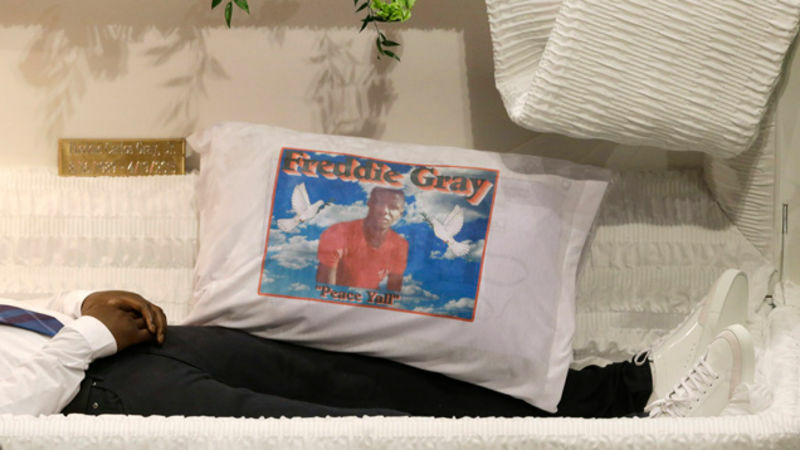 One of the police officers accused of killing Freddie Gray reportedly threatened to kill his ex-girlfriend two years ago, according to court documents obtained by the Guardian. Lt. Brian Rice, who, the report claims, also has also allegedly threatened to commit suicide, was reportedly disciplined internally for the threats and twice had his guns confiscated. 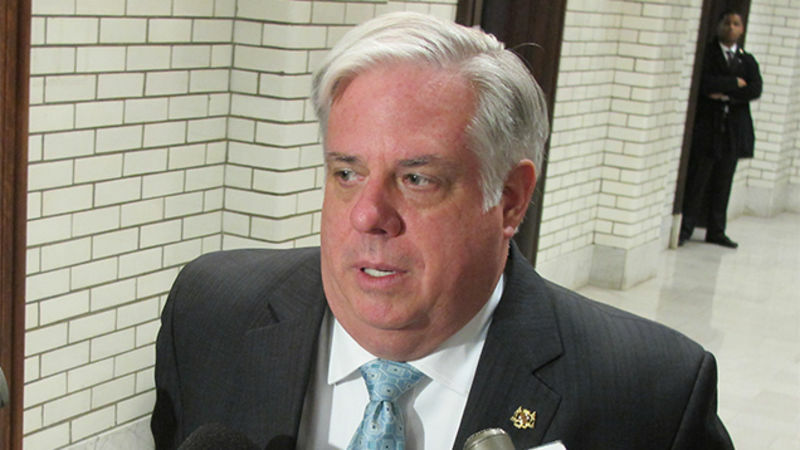 Maryland Governor Larry Hogan has ordered the withdrawal of the National Guard from the city of Baltimore, Agence France-Presse reports. 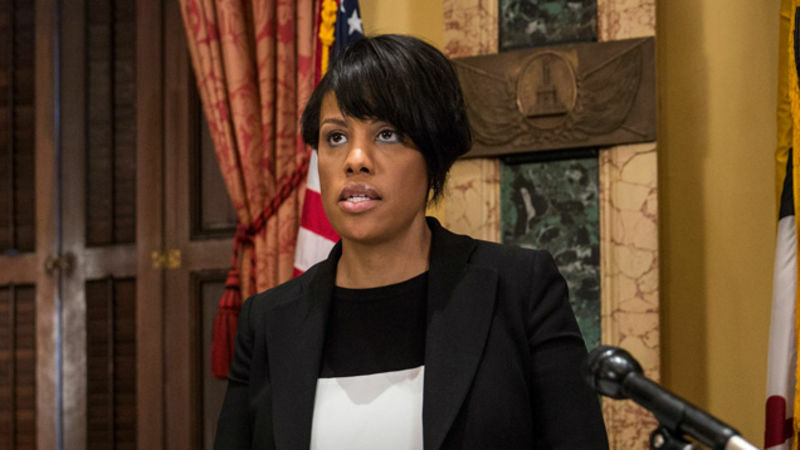 Baltimore mayor Stephanie Rawlings-Blake lifted the 10 p.m. curfew this morning. 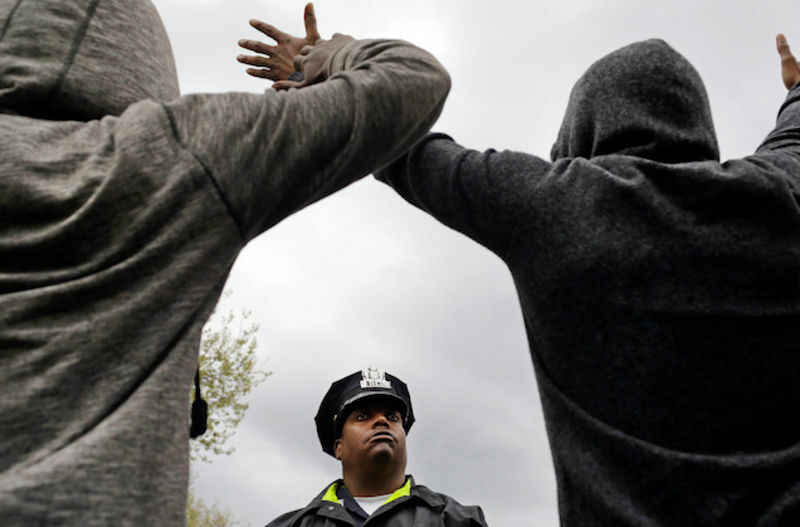 On Sunday morning, Baltimore mayor Stephanie Rawlings-Blake announced via Twitter she was lifting the city’s 10 p.m. to 5 a.m. curfew, effective immediately. 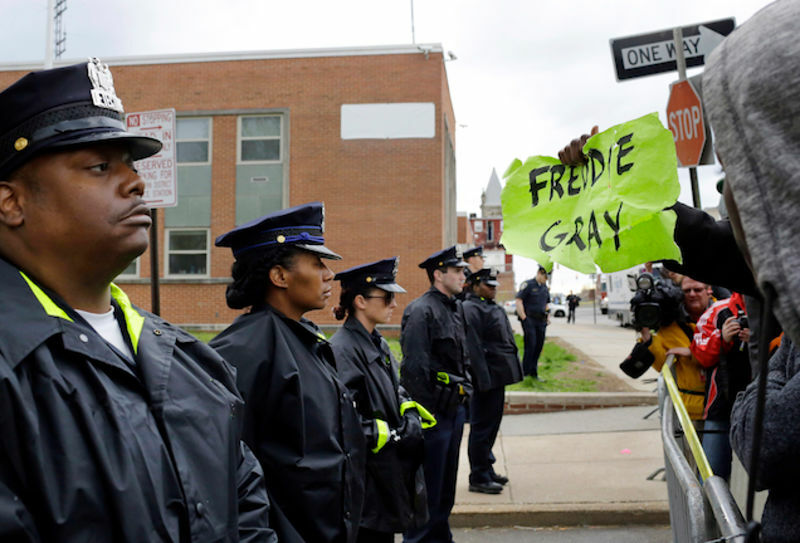 Report: Cop Dismissed Freddie Gray's Pleas for Help as "Jailitis"
During the 45-minute ride in a police van that killed Freddie Gray, an officer mocked the 25-year-old’s requests for medical attention as a case of “jailitis,” a new report from The Baltimore Sun reveals. 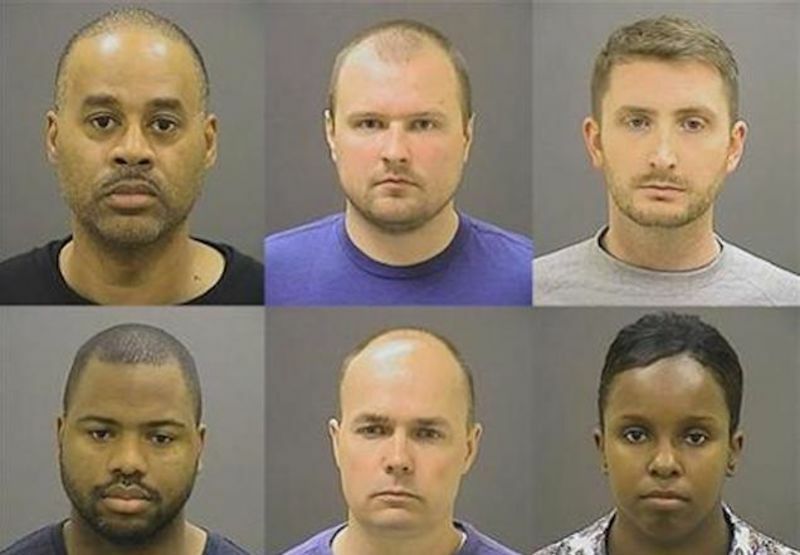 The six Baltimore police officers accused of being responsible for Freddie Gray’s death have posted bail. The bail for all six—including the officer charged with murder—was lower than the $500,000 set for 18-year-old protester Allen Bullock, who was photographed smashing a cop car and charged with eight misdemeanors. 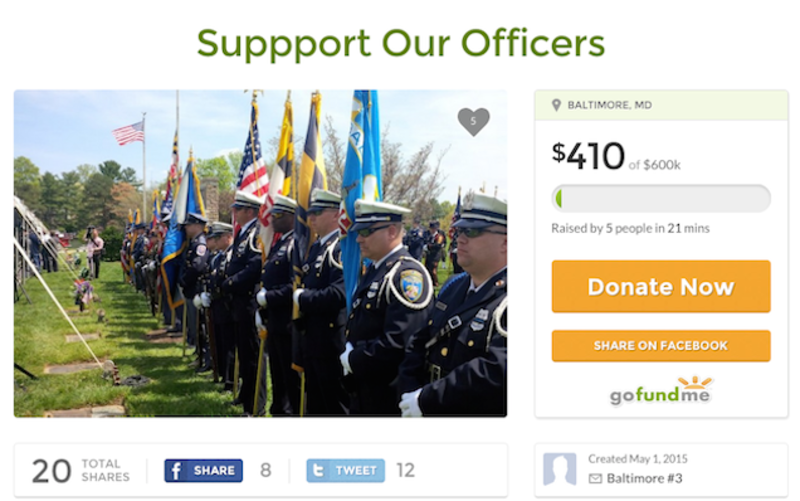 The Baltimore Police Union, the repulsive organization which last week compared peaceful protesters to a “lynch mob,” tried to start a GoFundMe for the six officers allegedly responsible for Freddie Gray’s death today. Thankfully, it was taken down within 40 minutes because it violated the fund raising site’s terms. Five of the six officers charged in the death of Freddie Gray are now in custody, according to Baltimore mayor Stephanie Rawlings-Blake. 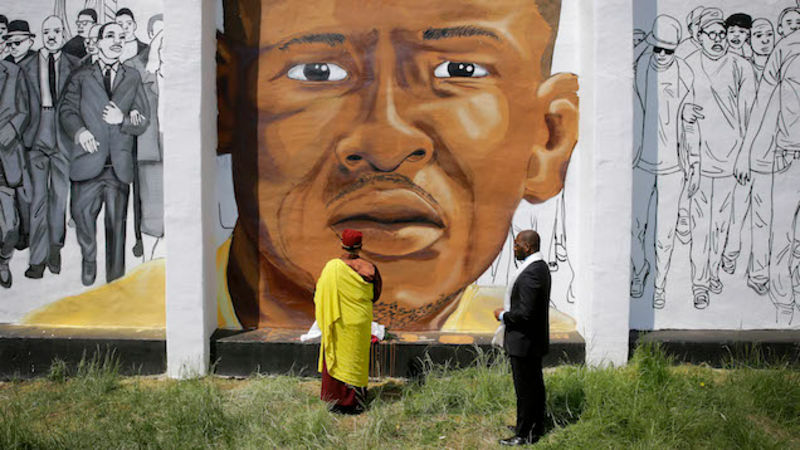 "Thank God That My Son Is a Thug"
According to those who knew him well, Freddie Gray was a funny, happy, outspoken, and well-liked guy whose life was cut short in the custody of the Baltimore Police last week. 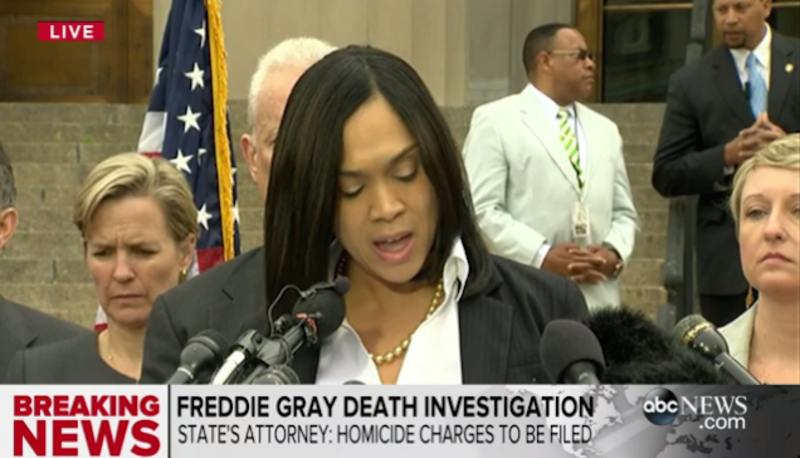 Freddie Gray’s death has been ruled a homicide by the Baltimore state attorney Marilyn Mosby. Six officers have been charged with a number of crimes, including second-degree murder, manslaughter, assault, misconduct, and false imprisonment. A warrant has been issued for their arrest. Knicks star Carmelo Anthony and a man who is not business magnate Russell Simmons marched in Baltimore today, Fox News’ Geraldo Rivera confirmed this evening in an awkward on-camera interview. 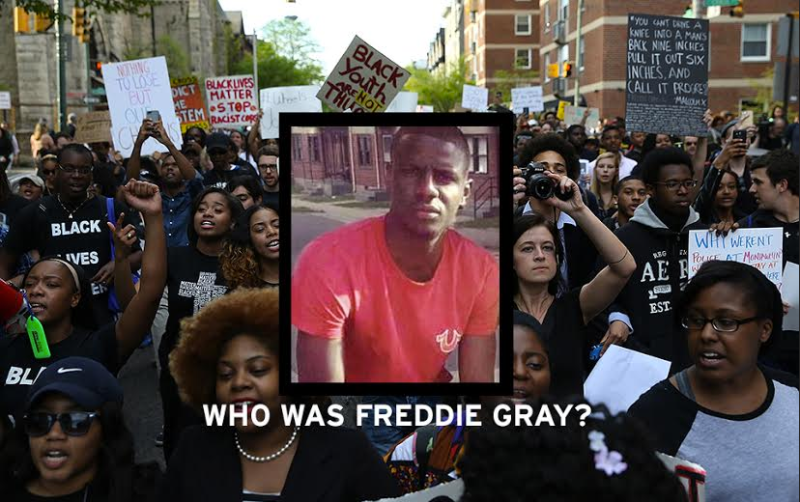 Freddie Gray sustained a fatal injury after his head slammed into the back of a police van, according to several law enforcement sources who spoke with WJLA. For every human tragedy offline, there will inevitably be a group of dedicated fuckers trying to make it worse using the internet. 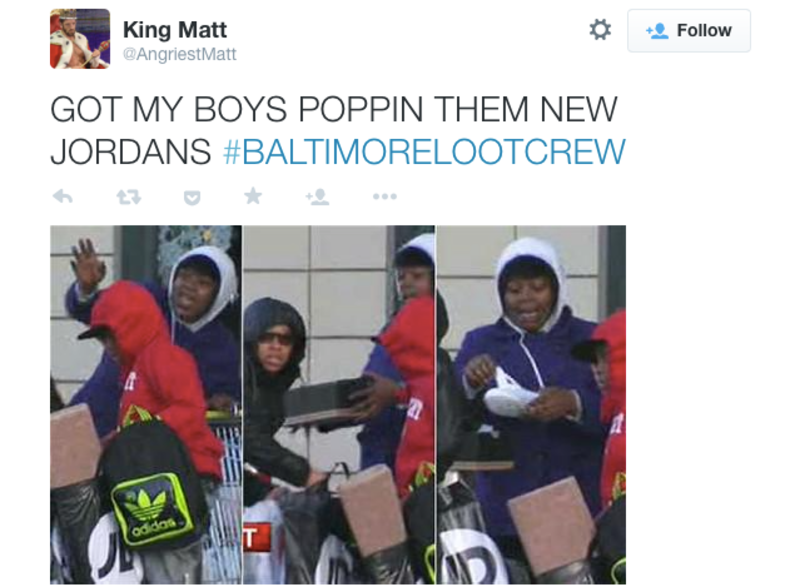 Today’s example is the #BaltimoreLootCrew, spreading white supremacist bile and misinformation about the Freddie Gray protests.